This week the Class of 2018 at Benton Community had an opportunity to celebrate their accomplishment of high school graduation. As a community, our school district worked together to coordinate an experience for both our seniors, our younger students, and our staff to celebrate together. Our senior Bobcats had a chance to walk the halls of all our buildings in the district one more time as a class. During this experience we visited 4 elementary buildings and finished the experience at the middle/high school where they currently attend. We hope this experience allowed our seniors to know how proud we are of this accomplishment in their life. 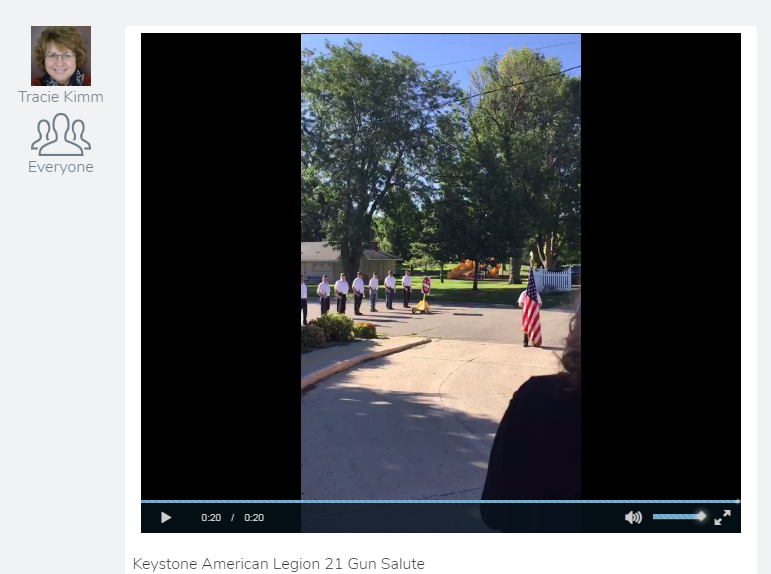 We also hope that this experience allowed our youth to see the final goal of education in action! Graduation is the beginning of new opportunities for our students. As educators in the system, we are so proud to have played a small role in helping these students accomplish the life they have chosen for themselves. Good luck Class of 2018! It's a great day to be a Bobcat! 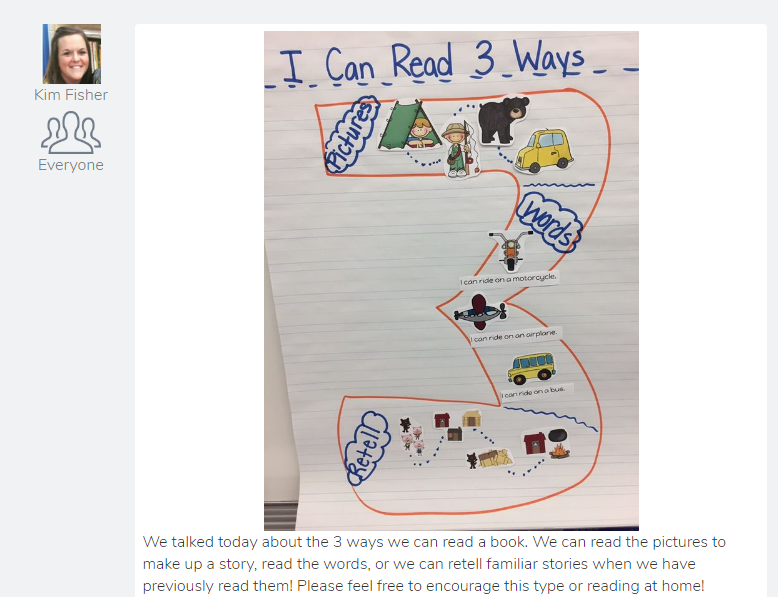 Seesaw is great digital tool for connecting students, families and teachers to one another. Seesaw helps students use 21st Century skills to document their work with an authentic audience. Families are able to see a glimpse into their child's school day and teachers are able to share in real-time. If you'd like connected to your child's classroom -- contact your child's teacher. As we kicked off the 2017-18 school year with our Teacher Leadership Team -- below are some of the comments we heard after one day of "Data Team Re-boot" led by Erikka Vosmek, our GWAEA School Improvement Consultant. I felt good about our learning and moving forward. Looking for specific piece of Hattie research (curing the poster activity) helped keep me focused and worked for me! The day affirmed and questioned my thinking. I left the day with energy and felt re-booted in a GREAT way! The processing time and focus with the variety of things helped my understanding. Reviewing our goals and going deeper and knowing this is not new was great. I felt the excitement and engagement in learning. Redefining the specificity in expectations are helpful. A system focus is instrumental in our success! Felt like we were collaborating and processing and moving forward. Awesome to share what is happening within teams and classrooms. These things make a difference in teaching and learning. Previous learning was connected and made sense. We are looking forward to helping create another great year of impacting teaching and learning for our staff and students at Benton Community. Based on conversations and feedback with staff and administration, we have asked the state to change our TLC plan from having Model Teachers (MT) to having Data Team Leaders as part of our #BCTLT. Our district's focus on using data to inform instruction and instructional practices is the main driver for this change. Currently, we have 17 MT's and want increase this number to 24 to be able to serve and support grade/content level teams in a more systematic way. Our plan is to train the staff members who will occupy these positions in the "Data Team Process" starting this summer. This training will be organized by our GWAEA support staff and District personnel. Conversations and surveys with current staff and administration to review if the current job description and direction of the MT position was meeting our district needs -- consensus was that is was not. We contacted surrounding districts on their current practices and job description. We coordinated our efforts with GWAEA to facilitate proposed changes and develop a potential training plan. We shared our concerns and solutions with our Benton Teacher Leadership Team and staff. We shared our concerns and solutions with our Benton Communications Team (our district advisory committee which is made up of staff, parents, students, board and community members). We shared our concerns and solutions with our Benton Board of Directors. Here is the link to the job description that was approved by the state. Sometimes we know exactly what we are doing and other times we stumble into things that turn out to be really beneficial. 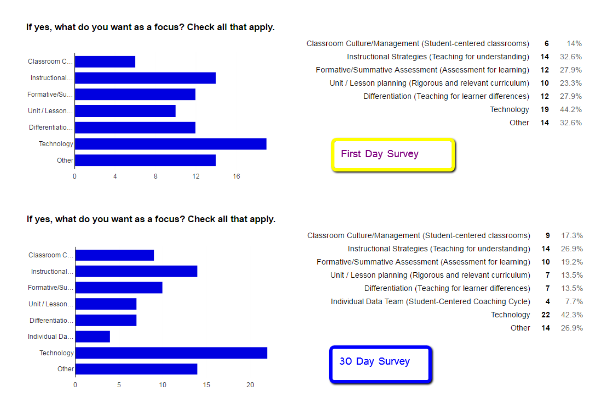 One of these really good things we stumbled into at Benton Community within our Teacher Leadership is surveying our staff every 30 days, asking for their feedback, and using this data as a driver for our district work. 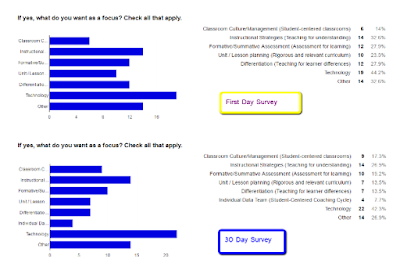 Below are screenshots for our beginning of the year and 30 day survey results. Reviewing this information and then being able to use it with intention with our staff has been shown to have impact as to how we are making a difference in our student learning experience at Benton Community. We've asked this question to gauge how receptive people are to our Instructional Coaches visiting teachers during instruction and planning time. We've asked this question to gauge how receptive teachers are to this type of support within our District. We use this information to approach our coaching conversations. We moved from Model Teachers to Data Team Leaders this year. 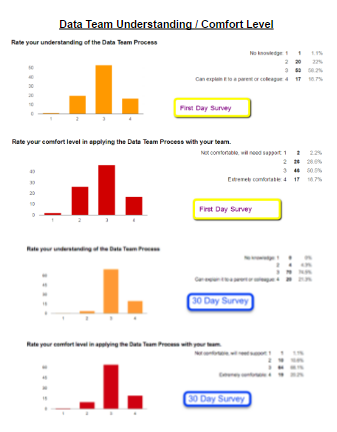 We use this data to help determine where we are in learning the data team process. We use this information to help partner with our supports (including our AEA partners) to determine our next steps. Benton Community School District is a Year 3 Iowa TLC school and has recently transitioned from utilizing Model Teachers to now having a Data Team Leader at almost all grade levels/departments PK-12. Our team has made data the center of most of our conversations, and with the support and guidance of our administration, the Instructional Coaches in our district have made it a goal to bring this data to a community place at all of our buildings. Many classrooms currently have data walls, much like this one in a kindergarten classroom at Keystone Elementary. This blog will focus on the community data wall located in the office at Keystone Elementary. What is a data wall, you might ask? A data wall is a space dedicated to displaying results over a period of time. 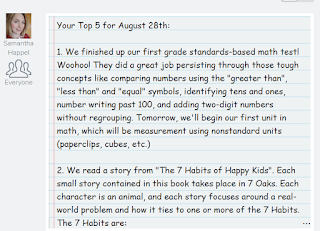 It is also a space to show whole school data, as well as grade-level or classroom data. Data walls are also an opportunity for self-reflection and an opportunity to identify gaps. If the data wall is in a community space, the names of students are preserved, and often, numbers take their place or general data is used. 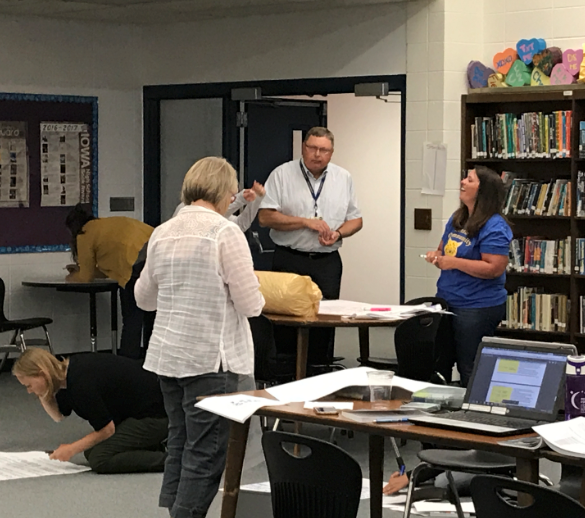 Keystone Elementary chose to get down to grade-level specific data from our fall, winter, and spring FAST assessments, as well as building-wide PBIS office referrals and weekly Progress Monitoring and Intervention data. Our data wall will give us a chance to look at trends and take ownership of what is happening in our classrooms. Data is recorded and tracked over time. We found that last year, sometimes our Progress Monitoring inadvertently was missed or incomplete. This type of result was especially heightened during shortened weeks due to holidays or inclement weather. According to the new Differentiated Accountability process in Iowa, 90% of the Progress Monitoring and Interventions must happen 90% of the time. 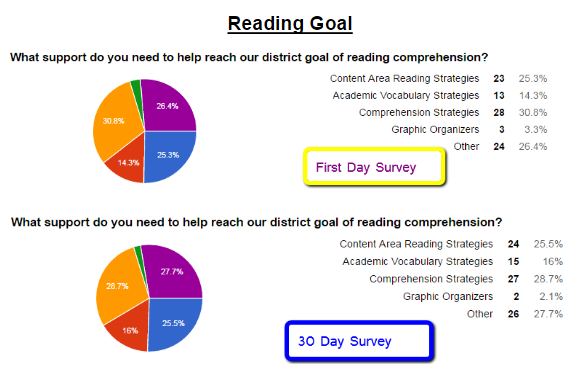 Our district has made it a focus to ensure that our Differentiated Accountability numbers continue to rise, and ensuring our Progress Monitoring and Intervention Time is being entered will help with this goal. Teachers make these two integral pieces a part of their classroom routine. On Wednesdays, reports are run for the previous week and the data wall is updated. Teachers are working hard to remember to make this a part of the routine, and as a result, Progress Monitoring happens every week and Interventions times are being entered with fidelity. As the quote says, it's all about the kids. This data wall is not about pointing fingers or calling each other out. Instead, it is about embracing the "us" mentality. These are our kids and we can work together to ensure their success. For more information on data walls at Benton CSD, don't hesitate to reach out! This blog post was originally posted at www.townsleyaj.blogspot.com! TLC Year 1 and 2 - What's Worked For Us? 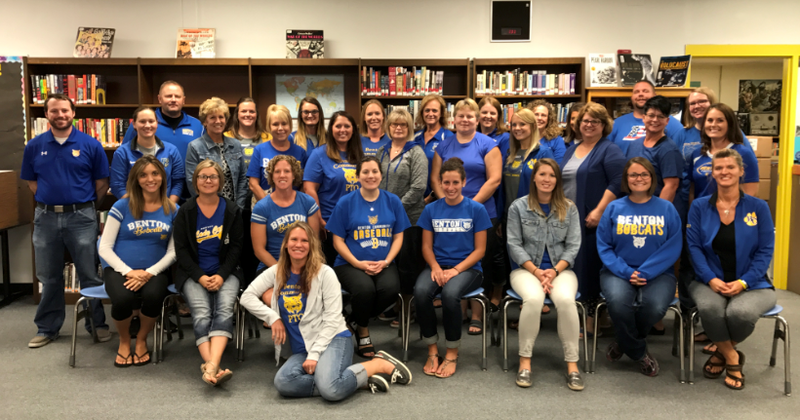 Benton Community - BCTLT is closing out our second year of participation in Iowa's Teacher Leadership and Compensation grant to garner teacher leaders from within Iowa's schools. Having been one of the first 39 districts in the state of Iowa to implement, we had to build our plane while we were flying. We now have the opportunity to learn with the many other Iowa districts who are a part of this teacher leadership movement. Benton Community has had the pleasure of having several districts ask us what has worked for us. Here is a snapshot of a few foundational pieces of our system. If you would like more information on any of these tools, please don't hesitate to let me know. This coach check-in is a modification from an interaction scale created by Susan Woodruff which can be found here. We have found that a 5-point interaction scale works best for our district. Knowing that relationship building is the foundation of great coaching, many of our interactions started off as 1s and 2s for the first few months. As our coaching interactions increased and our coaching conversations deepened, we experienced more 3s, 4s, and 5s. Our team utilizes this check-in to ensure we aren't accidentally leaving out any staff members and it helps us be intentional about our interactions with staff. We also use the comment feature to log what types of interactions we are having and to keep track of the conversation focus taking place. --How are things in the classroom? --Are you having a good year? --How is a certain initiative going? --Could you come and watch this? --Could you help me with this? --Modeling / Co-teaching --Could you find this for me? --What went well? --What would you change? --What steps in the future? --Will you plan with me? By happy accident, we started sending out surveys to staff at the beginning of our first year. About 30 days into the school year we sent out another. This practice has continued through our two years of implementation. This not only gives us a great pulse on our district, it also gives us a gauge of interactions with staff and a chance for us to garner feedback from our teachers. Below are a few of our staple questions each time we survey. 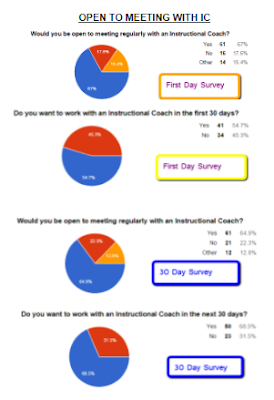 --Are you willing to work with an Instructional Coach? This question gives us some baseline data on whether or not our staff is open to working with our coaches. The percentage of staff willing varies depending on the busyness of the school year. Our trends show an increase in participation in October that lessens around December. Then, willingness picks up around January and levels off in April. --If we visit your room, would you like us to drop in or make an appointment? This question helps us form a plan for observation and drop-ins for classrooms. Instructional Coaching at Benton Community is optional. We want teachers to feel comfortable with our presence and know that we are welcome in classrooms, so this question helps us know which classrooms,we can drop by and which ones we need to set up a convenient time to visit. --Where will you see your team needing the most support in the near future? This question helps us decide where our staff is as a whole. Do we need to focus our learning on Priority Standards, Proficiency Scales, Common Formative Assessments, or MTSS planning and support? Each team's response differs and we can tailor our support to meet each team's needs. --What additional feedback do you have for #BCTLT? This open-ended question gives our teachers an opportunity to give us feedback on the successes and challenges of implementing a new system. 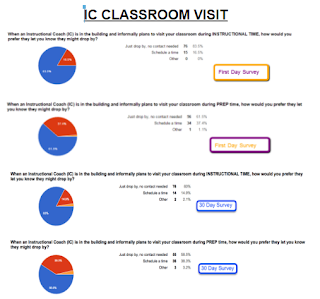 Our surveys are not anonymous because we need to be able to follow up with teachers. This can be one of the most impactful questions you ask to get teachers to exercise their voice in utilizing the teacher leadership platform. We are fortunate that our teachers utilize this question to give us honest, thought-provoking, and growth-minded feedback to help our system benefit to the fullest. This is a resource that came out of our Model Teacher training before we started implementation of year one back in August of 2014. Something that we thought would take an hour or so took more than a day of discussions and modifications. We brought this resource to teachers at our first staff in-service and they were able to take more ownership in our system because the role definitions were created by teachers to help them understand our system in its various capacities. Your stakeholders need to know what is happening in your district. Your teachers need to see what great things are happening down the hall. 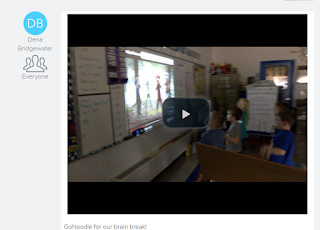 Two ways we were able to share are by participating in Learning Walks and hosting #BCedCamp. We have shared our journey with teachers in and outside of our district. By doing so, we have opened the doors to learn from each other and we have had the pleasure of learning with other districts who are leading the way in their teacher leadership journey. Our Middle School/High School got their feet wet with Learning Walks and they quickly spread throughout our three elementary centers. This gives teachers an opportunity to visit other classrooms and reflect together during a scheduled time once every one-two months. This has helped increase the amount of time teachers spend learning from and reflecting with one another. 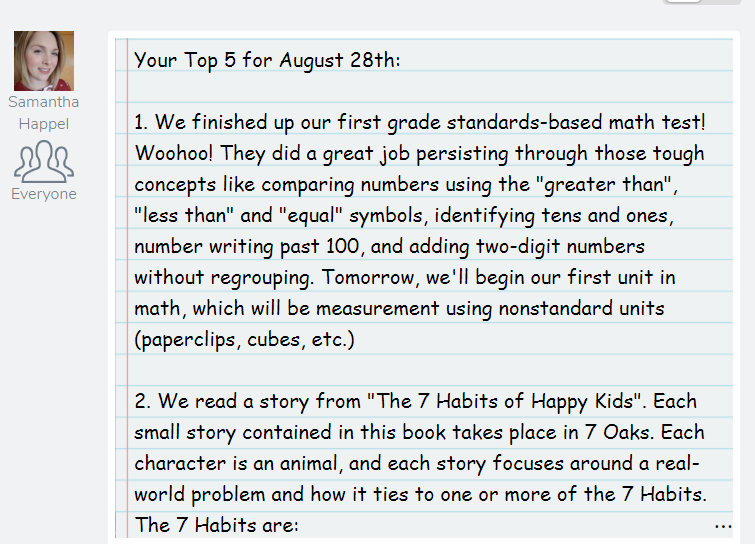 They've also spent more time opening up their classrooms to share the great things their students are accomplishing. In addition, on a whim last April, we decided to invite teacher leaders from across Iowa to Benton Community to learn together about the successes and challenges of this system. We are hosting year of #BCedCamp 2 in June and would love to have you! 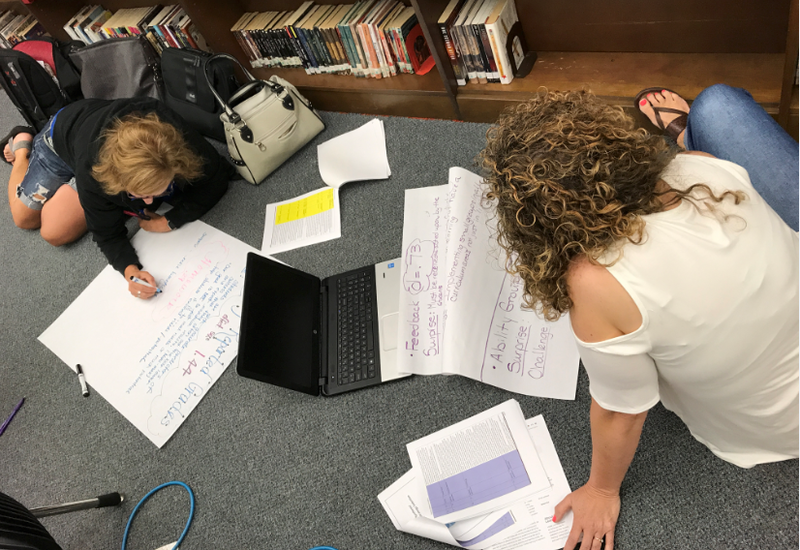 Whichever tools or resources you choose on your teacher leadership journey, please know that you must utilize what works best in your district. What works for us may not especially work for you, and "trial and error" and "risk, fail, and repeat" are your best bets for finding success. There is no exact fit for any district. You must modify what is working for one district until you find the right fit to meet the needs of your teachers. Best of luck on implementing teacher leadership! Let me know if I can be of any service to you on this journey.